THE MAIL BOAT RMS Leinster, which set sail from Dún Laoghaire in 1918, is relatively unknown despite being called “the greatest single loss of life in the Irish Sea”. Last week, relatives of the victims of the sunken boat gathered for the launch of a book that commemorates the fateful ship and to honour the lives lost. The Leinster, which was armed and also carrying soldiers returning to the war, was sunk in a torpedo attack by a German U-boat, just a month before the end of World War I. A large proportion of the lives that were lost when the Leinster sunk were thought to have been Irish – and probably far greater in number than the Irish who died on the Titanic in 1912 or the Lusitania in 1915. The number of Irish deaths on the Titanic totalled 78 – on the Lusitania it totalled 140. There were 771 people in total on board the ship; 77 of them crew members. There families of many different nationalities aboard when it set sail, including Welsh, English, Scottish, Canadian, Australian, New Zealanders and American. ‘The Last Voyage of the Leinster’, launched last Thursday, aims to give a human account of the loss of the mail boat just outside Dublin Bay. It tells the story of the ship’s postal sorters who were the first to die when the first torpedo struck the ship, hitting the postal sorting office and killing all but one of the postmen. It also includes messages from British and German ambassadors to Ireland who sent goodwill to the descendants of all those who were on the ship when it sunk and also direct their words to the families of those who were bereaved. As the book states, “family stories handed down through generations is arguably a better means of establishing the truth, especially as families have no agenda other than remembering their dead”. Relatives of the victims and survivors of the RMS Leinster were joined by the Mayor of Holyhead Councillor Ann Kennedy, Cathaoirleach of Dún Laoghaire-Rathdown Tom Murphy, and representatives of the Australian and Canadian governments. If you want to learn more about the 2018 Centenary Commemorations of the RMS Leinster, click here. 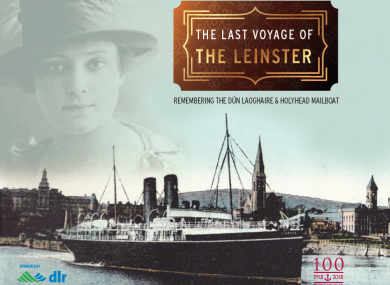 Email “Great tragedy of 500 lives lost in sunken mail boat RMS Leinster retold”. Feedback on “Great tragedy of 500 lives lost in sunken mail boat RMS Leinster retold”.